The Division 2 shifts the setting from New York City to a ruined Washington D.C. While the gameplay aims to fix issues players had with the original, statements from one of the game’s creative directors about the narrative are frustrating. The goal, we’ve been told, is not to make a political statement, but in this day and age, that’s impossible. It’s about time we stop pretending that it is. In the world of The Division, a massive bio-terrorist attack on Black Friday led to the outbreak of a plague that ravaged the United States. As institutions and order crumbles, it’s left to government agents from “The Division,” a group of sleeper agents hidden among the populous, to restore order. In gameplay terms, this means shooting bad guys and finding rare loot. The Division was a fun game to play, its snowy Manhattan setting striking and gunfights intense. But the implications were unsettling. The player was special, a man or woman with a badge given free rein to shoot mostly hoodie-wearing looters. In real life, issues of violence by police and everyday citizens had been brewing in America. When The Division released in March 2016, it had been four years since George Zimmerman shot and killed Trayvon Martin. In 2014, police officer Darren Wilson shot and killed Michael Brown. Following the shooting, protests in Ferguson, Missouri lasted for two weeks. Police used tear gas, flashbangs, and rubber bullets to disperse crowds. More waves of protest would follow Wilson’s acquittal in 2015. In light of all this, it could feel strange to play The Division, a game where you gun down whoever you want without consequence. It wasn’t an intentional commentary, but it was, undoubtedly, political. The Division 2, with its setting of a broken Washington D.C. and mission of saving America, arrives during a similarly charged political climate. Speaking to Kotaku editor in chief Stephen Totilo yesterday, Terry Spier, one of the game’s creative directors at Red Storm Entertainment, denied any intentional political commentary on the game’s part. 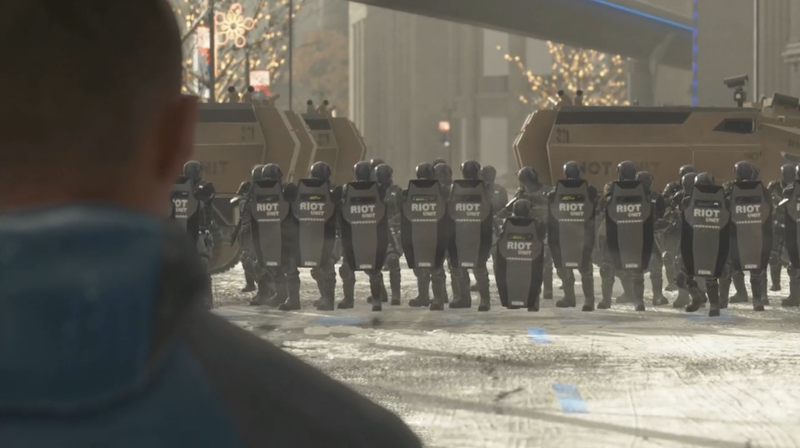 Marcus, played by African-American actor Jesse Williams, stands before riot police during a peaceful protest in Detroit: Become Human. Cage told Kotaku the game was not meant to be political. By now, we should be familiar with the phrase “it’s not a political statement” when it comes to video games. Although Far Cry 5 was revealed to the press in a presentation referencing Brexit and the 2014 standoff between Cliven Bundy’s militia and law enforcement, the released game shied away from naming these inspirations directly. Last year, Detroit: Become Human director David Cage told Kotaku that his game was “ really about androids,” and devoid of political commentary even though Detroit has a history regarding both manufacturing and race relations — including one of America’s bloodiest race riots in 1967 — that make Cage’s choice of setting fraught. The game quotes Martin Luther King Jr, investigates public sentiment toward “violent” political action like property destruction, and allows players to demand voting rights and property ownership for androids. It was about more than just androids, and The Division 2 will be about more than loot drops. The idea that a game about saving the American capitol has no political bent would strike anyone as absurd, even if we should not be surprised at Spier’s insistence. This has to do with how our brains process symbols. The various symbols of America—the White House, the American flag, the Washington Monument — have history attached to them. When we see these symbols, we cannot help but recall that history and the emotions they evoke. The American flag is nothing but a piece of cloth, but, depending on the individual, it’s either a symbol of aspirational ideals or the banner of imperial conquest. Video games are packed with symbols, all of them evoking different thoughts in players. A withered White House viewed through the eyes of a 2018 gamer might remind them of grift and corruption. It might pluck at patriotic heartstrings. Spier might want nothing more than a fun new city to explore, but every street corner holds potential meaning. This was true of The Division, which had missions tasking the player to restore power to Times Square, New York’s capitalist and tourist centre, while also having them fight off prisoners from Riker’s Island. The game’s action and the context it occurred in revealed political messages. What is The Division saving? Government, commercial interests, and infrastructure. Who is the enemy? Convicts, industrial workers, and rioters just trying to survive. How do we save the country? By firing enough 5.56 ammo. The Division 2 will have its own set of answers to these questions. This isn’t to say that you shouldn’t load up The Division 2, zone out, complete a raid, and call it a night. You can definitely do that, and you’ll probably have a lot of fun. For all its distance, I enjoyed playing The Division with my friends. But games can’t pretend not to have politics, that The Division 2’s D.C. setting has no implications to players, that the corpses you leave behind don’t say anything at all. At the end of the day, The Division 2 will be a game about government agents banding together to revive America’s capitol. We will fight in the downed wreckage of Air Force One, in the shadow of the Washington Monument, and possibly in the actual halls where political power rests. Passing on the responsibility of that, as Spier did, disrespects the intelligence of the players, who will bring their own interpretations to the setting whether the developers want them to or not.